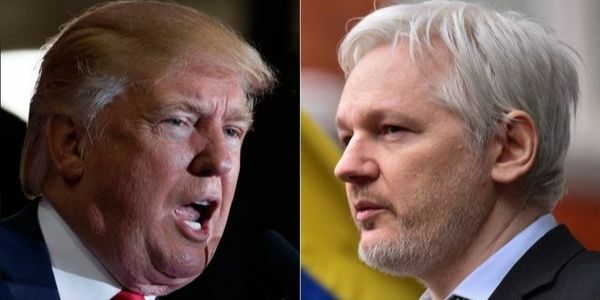 With the news that WikiLeaks founder Julian Assange was arrested in London on a hacking charge filed by US prosecutors, Trump took it upon himself to rewrite history, claiming all of a sudden that he doesn't know a single thing about WikiLeaks. But clearly, during the 2016 presidential campaign, Trump not only knew what WikiLeaks was, he repeatedly celebrated the site for releasing thousands of stolen emails from the Democratic National Committee and Clinton campaign chairman John Podesta in an attempt to hurt Hillary's election prospects prior to election day. In fact, he explicitly cheered on WikiLeaks more than 140 times as the organization worked against his opponent. Of course, it's no surprise that Trump would take whatever position is politically convenient at the time. He's never actually stood for anything but himself and doesn't actually have any long-held positions; he just says whatever fleet thought is most politically convenient for him at the time. He has used the same strategy of outright lying when his former foreign policy adviser George Papadopoulos, campaign chairman Paul Manafort and even personal lawyer of 10 years Michael Cohen all found themselves in hot water. But the lies were not lost on the American public. So the fact that Trump went from incessantly praising WikiLeaks to pretending that he's never heard of them the second that Assange was arrested should surprise exactly no one. We, the undersigned, demand that Trump stop gaslighting the American public and come clean about not only his knowledge of WikiLeaks, but support for Julian Assange when it was politically convenient for him. We are done being lied to.